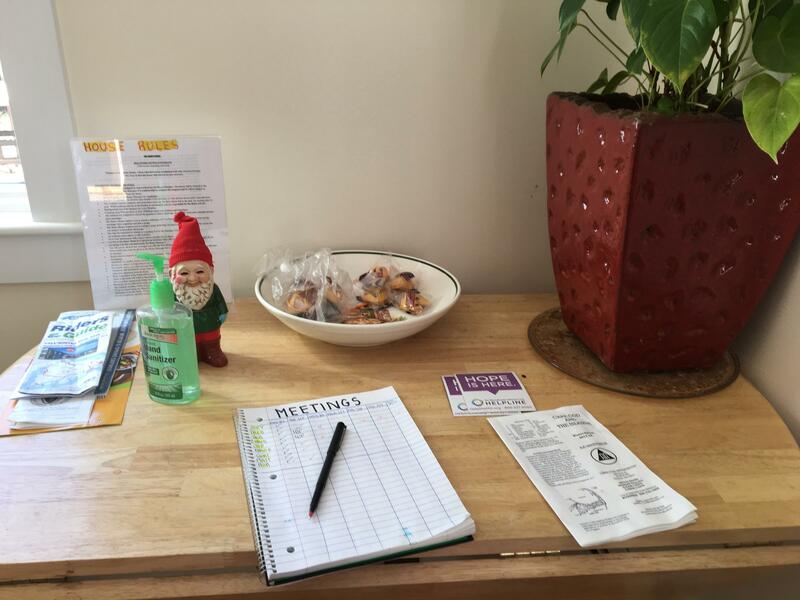 The entrance table at the Bauer House, where residents can log meetings they've attended and the house rules are posted. This is part one of a three-part series examining the pressing need for sober houses, their importance in the addiction-recovery journey, and the challenges they can pose for communities. All the stories can be heard here. Just off a busy Falmouth street, near the center of town, is a sober house named the Bauer House. Each Monday the residents gather to discuss chores and house needs — but the meetings also provide an opportunity to talk about coping with addiction and independent living. The Bauer House's nine male residents have rules to follow. There are drug tests at random, and each has to attend a minimum number of Alcoholics or Narcotics anonymous meetings. Rooms are inspected, curfews are enforced, and if someone is found using drugs, they will be told to leave. "Guys like structure," house manager Rick Conway said. "They're coming out of early recovery, and they're still cloudy." Conway makes sure that everyone is cleaning up after themselves, and that no one is using drugs or alcohol. "The guys that really get that, they will follow you," Conway said. "Those are the guys that survive." Most of the residents at the Bauer house have been grappling for years with addiction to alcohol or opioids. For many, the sober house represent the final test before going back to living on their own. Ray Tamasi of Gosnold, the Cape’s largest addiction treatment center, said that Falmouth has a disproportionate number of sober houses. "Right now there are between 35 and 40, maybe even 45 in the larger Falmouth community. Per capita, that's got to be, if not the top in the state, close to it," Tamasi said. The big draw is Gosnold, headquartered in Falmouth. The center attracts people from elsewhere in the state for detox and rehab services. Once patients complete treatment for an addiction, Tamasi said, it’s often easier for them to stay. "And that is the primary reason why you've got this continuation of services in an area where people feel they've gotten better," Tamasi said. "It's a little recovery cocoon, if you will." But for all their importance in an addict’s journey to recovery, sober house operate largely unregulated, in part because they don’t provide any medical services, they’re just residential homes. "They're not eligible for insurance," Tamasi said. "They're lodging houses. Health insurance is never going to pay a provider of sober house services." Back in 2016, after a string of overdoses at sober houses across the state, a non-profit coalition called the Massachusetts Alliance for Sober Housing was given a contract by the state to certify sober houses. The certification is optional. Estimates are that in Falmouth only a quarter of sober houses are certified. Richard Winant, a member of the Alliance's board of directors, said there’s a balance to strike between over regulating and under regulating. "What would happen if you — I don't want to say over-regulate, but that's the best way to describe it — a lot of those houses would shut down," he said. Enacting formal regulations would likely also mean requiring all sober houses conform to public building code, which would include putting in things like handicap ramps and sprinkler systems. "If they force all sober houses to have sprinkler systems, you're talking a $40,000 or $50,000 expenditure," Winant said. And with the state's current opioid crisis, beds at any sober house, even an unregulated one, are in short supply. Joseph Schoepplein is a 22-year-old opioid addict in recovery and one of the Bauer House's residents. Before coming to the Bauer House, he lived in a different sober house nearby, where he says the lack of structure was hard for him. "We can say the house wasn't a good one," Schoepplein said with a laugh. "A lot of them were using. And when I'm early on [in recovery], I can't be around that, because if it's in front of me, there's a good chance I'm going to do it." He came from off-Cape for treatment at Gosnold, but has decided to stay. "Moving here three years ago was a bit of a shock," he said. "Nothing's open past 9 o'clock! So it's definitely different. But that was three years ago, and I've gotten used to it." The average stay for a person in a sober house is about six months, though it isn't unusual for residents to leave and return if they relapse. Schoepplein said he doesn't have plans to move back to Boston, where he used to live, and where he said he'd be worried about falling back into old habits. "I don't see myself ever going back there, there's no place for me there," he said. "This is my life now." Correction: An earlier version of this post identified the group MASH as the Massachusetts Association for Sober Housing, when it is the Massachusetts Alliance for Sober Housing. Additionally, MASH was not founded in 2016, as previously stated; rather, in 2016 the state awarded its first contract for the certification of sober housing to MASH, which was already in existence. New Bedford has some of the highest rates of opioid overdose-related deaths in the state, and as the toll continues to rise, the New Bedford police department is considering some new approaches. There are computer models that help gauge the likely outcomes of any number of decisions – whether it’s the Federal Reserve raising interest rates, a new climate policy, or even what you choose to eat for breakfast. That hasn't been the case for the opioid epidemic. Now, researchers at Stanford University have developed a computer model of the epidemic that they hope can help point policymakers toward effective strategies.